The best solution for lighting your home and landscaping is LED architectural lighting. It offers a pure, warm, white light that enhances your home and landscape’s natural tones. The precise beam angle illuminates exactly what you intend– and nothing you don’t. Maintenance is minimal because there are no bulbs to change, and mosquitoes aren’t attracted by the light. By using 75% less electricity than incandescent lighting, LED lighting also reduces your energy costs. With solutions for every application, including decks, patios and ponds, LED architectural lighting is what we recommend to all of our customers. 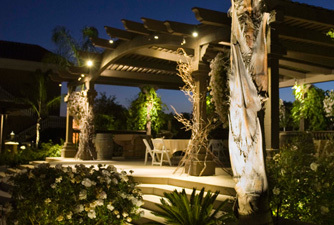 To view some beautiful LED lighting examples, visit our favorite lighting brand’s website, Kichler Lighting.